Discover Spiritcraft Furniture for heirloom quality live edge and slab dining tables and custom made hardwood table, desk and island tops handcrafted to endure generations. We craft our custom made solid wood table tops and live edge tables in our East Dundee, Illinois wood shop and serve local clients through our Chicago area furniture store and national clients via our blanket wrapped, room of choice nationwide delivery service. All slab, live-edge and custom solid plank table tops are crafted from sustainable kiln dried hardwoods and rescued natural edge slabs. Discover our custom made solid wood table tops, live edge dining, console and conference room tables and slab furniture, click image to open large, detailed images. Our live edge dining and conference tables, slab table tops and kitchen island, coffee, desk and solid wood restaurant tops are handcrafted in kiln dried Black Walnut, Cherry, Sapele Mahogany, Maple, Ash and More. We craft our slab tables & table tops, kitchen islands, dining, conference tables and desks from stunning and unique kiln-dried slabs, flitches and live edge hardwoods. Our local live edge hardwoods are rescued from large, storm downed and otherwise fallen trees. Our slab tables are offered with custom designed legs in solid hardwood, stainless and steel and are finished in our proprietary easy to maintain and durable no-ring finish. Learn more about our hardwood slab furniture, live edge dining tables and counter, island, desk and table tops for commercial, hospitality and residential installations at slab and live edge tables and tops. Our custom made solid wood table tops in Walnut, Cherry, Sapele Mahogany, Maple, Ash, White Oak and other select hardwoods offer superior quality and long term value. Our custom made hardwood table tops for restaurant, office, home & commercial installations are handcrafted in our workshop from sustainable hardwoods and finished in an easy maintenance and enduring finish. Our custom table tops are available in nearly any configuration, size, thickness and hardwood. Our production woodworking shop, years of furniture making experience and personal attention to detail ensures clients superior quality. We craft flat table tops from stable kiln dried hardwoods with perfectly machined glue joints, and offer the same level of craftsmanship whether you need a single table top or a hundred tops in various sizes. Read more. Our furniture showroom and live edge table store serves the greater Chicago area and is located in downtown East Dundee, Illinois. Visit us to browse our furniture store & showroom to view live edge dining tables, occasional tables and finished natural edge slab tops. You can also view our inventory of kiln dried live edge slabs and hardwoods to find the perfect hardwood for your dining table, island or conference table top. Our woodworking shop, drying room and kiln offers additional insight into what sets us apart from the competition as does our years of experience in handcrafting tables, table tops and furniture that will endure generations. We have finished live edge dining tables, slab and rectangular table tops for immediate sale but can conspire with you to design and create that showpiece live edge or slab table you have been dreaming of. Conference tables, desks & solid surface work tops handcrafted in Walnut live edge and beautiful slabs of dense Sapele Mahogany, Maple, Ash, White Oak and other select hardwoods are crafted to handcrafted quality at production shop lead times. 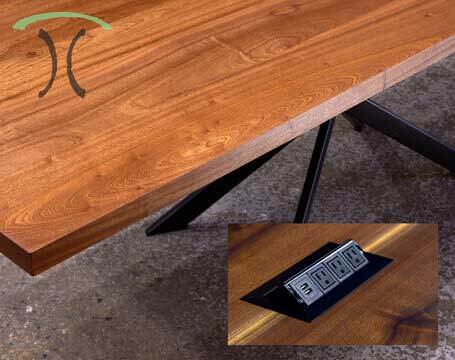 We specialize in live edge and thick slab conference room tables and large desk tops and solid hardwood work surfaces. We serve commercial, restaurant, hospitality clients and interior designers - architects nationally for office, corporate, library, restaurant and retail installations. Rediscover the real value of enduring quality. Visit our Chicago area live edge and slab table showroom for conference tables, desk tops, solid work surfaces or island, counter and other commercial custom made hardwood tops in East Dundee, Illinois or call 224-801-1969 for more information. We ship nationally through our trusted White Glove Delivery Partner. Read more. Our custom table tops and live edge slab tables are handcrafted to endure generations in solid kiln dried hardwoods such as Black Walnut, Cherry, Sapele Mahogany, Maple, Ash and other species. At Spiritcraft Design Furniture, we offer solid handcrafted live edge furniture and tops that are made to endure generations through our craftsmanship, understanding of wood movement and our insistence on using only kiln dried hardwoods. All live edge dining and coffee tables, island, counter and desk tops are custom made from rescued trees that are sawn and then kiln dried in our own state of the art dehumidification kiln. Our custom made table tops are offered in any thickness, in square, rectangular, oval shapes and crafted with meticulous and perfectly crafted glue joints using wide hand selected boards. Visit our Chicago area hardwood table top retail store for handcrafted dining, restaurant, coffee, desk or conference table tops in East Dundee, Illinois. The Spiritcraft Design Group, serving Chicago area and national clients from our East Dundee, Illinois workshop and home decor store. Discover our online decorative pillow boutique. Spiritcraft Pillows features our renowned throw and accent pillows in original designs that are handcrafted in our fabric workroom. We offer custom made window treatments designed to enhance our clients interior decor style and personality. We offer custom drapery, valance & cornice treatments and blinds and shades that will transform your living space. Visit our home decor showroom and furniture store to view pieces of our original solid wood tops and our inventory of finished live edge slab tables in Walnut and other hardwoods. Select pieces are on display along with upholstery, designer fabrics and custom window treatments.